The Audubon Market has returned to the parking lot at Stardust Video and Coffee 1842 East Winter Park Road. This market opens every Wednesday night and runs from 5 PM to 9 PM. This is a small local market with live music, a massage station, a fortune teller, a table of delectables like candied apples and other sweets, hand crafted jewelry and clothing, plants, the list is endless. Most importantly it is a place where friends can mingle and talk. I bumped into Karrie Brown who was selling some of her hand made feather hair pieces. Karrie introduced me to the caricature artist at the event named Marie Bolton - Joubert. Marie is a whirlwind of constant activity. She introduced me to a cause she is backing which involves the shooting of 2 dogs here in sunny Central Florida. 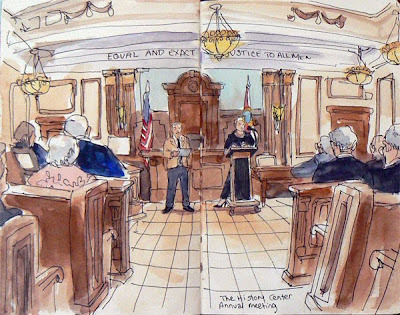 She showed me a courtroom sketch she did of an early hearing in this case and now I am planning to go to the court to see if the shooter is acquitted. I should post about this hearing in early November. Then she insisted I sit down and she whipped out a caricature of me in a matter of minutes while talking the whole time. The caricature is great! 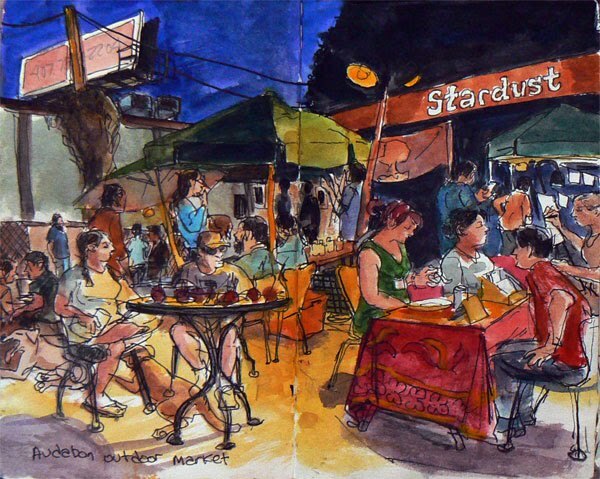 I neglected to mention that the reason I went to Stardust Video and Coffee was to attend Dr. Sketchy's but once I discovered all the activity in the nighttime market I had to sketch the market and I never went inside. It was boiling hot outside as well and I had to wipe the sweat off my hands several times to keep from smearing the watercolors. After an Orlando Philharmonic Board meeting, board members and friends of the Philharmonic were invited to sit on stage during a rehearsal for a concert of Russian Masters on October 30th at 8 PM at the Bob Carr. Christopher Wilkins who has just signed a five year contract to conduct the Philharmonic, talked for a while about the concert and introduced the pianist for the evening, William Wolfram. Christopher explained that Shostakovitch's Symphony No 5 in D minor is one of the iconic symphonies. The other piece to be performed was to be Rachmaninoff's Piano Concerto No 2 in C Major. When the Pianist William Wolfram was out of the room, Christopher explained that he and the pianist had worked together several times but this was the first time the pianist would have performed in Orlando. Chris also said that in the past the Pianist had played a practical joke on him and that tonight he hoped to play a practical joke in return. In the Rachmaninoff Piano Concerto, Chris asked the whole orchestra to play their parts a quarter note higher than it is written in the sheet music. That way when the pianist, began to play his part, it would sound all wrong. The practical joke worked as planned. When William Wolfram began to play the piano part, the conductor had to stop everyone and he said to the pianist, "Well these things happen". What was fun was that the rehearsal came to a screeching halt a second time before the pianist realized he was being toyed with. He and the conductor shook hands and had a good laugh as did the whole orchestra. The pianist then stood up and began jokingly walking off stage saying "Well goodnight everyone." There were 3 rehearsals for this concert. One rehearsal was canceled in order to save money. 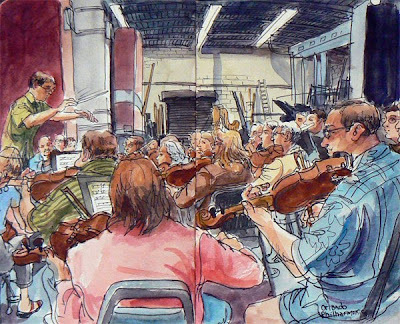 The Philharmonic is proud to have balanced it's budget as of June 30th of 2009. Next year the Phil will be staging several partially staged operas to help keep opera alive as an art form and to nurture the community's passion for opera. Carmen and Porgy and Bess will be staged with the orchestra being placed on the stage rather than hidden in the pit. As the orchestra began to perform the Second Concerto, Christopher Wilkins interrupted and shouted out" You have to be more forceful. You have to punch it in the face!" 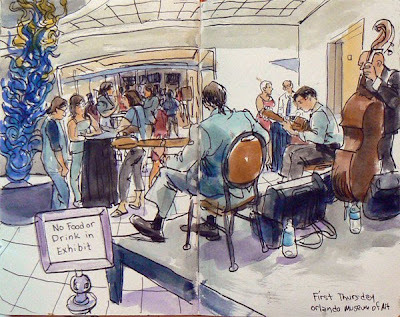 I went to 1st Thursdays at the Orlando Museum of Art to see "Rach"-tober: Music Meets Art. From Rachmaninoff to Rockabilly. How do sound and vision unite in our world? The focus of the show was on music, musicians and art influenced by music. Considering the theme of the show I felt I had to draw the musicians, Orlando-based gypsy jazz band, The Cook Trio, who were hired to play during the event. 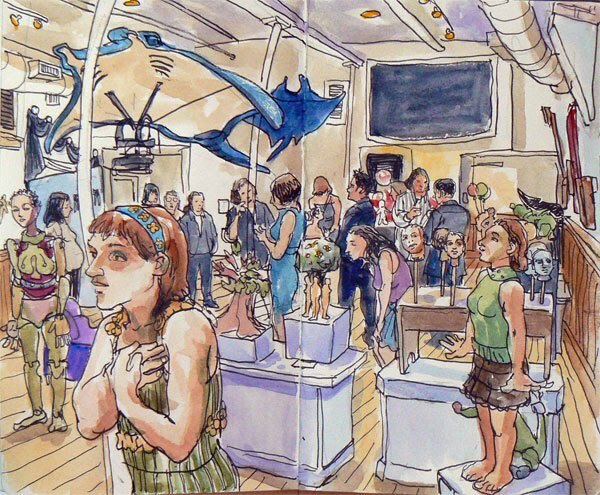 In the sketch you can see the large Dale Chihuly glass sculpture which rises up to a skylight. In the front gallery of the museum there were 18 artists whose work was on display. I was most impressed by the work of Plinio Pinto who had large watercolor portrait paintings of rock stars. Food at the event was available from Infusion Tea and there was a cash bar. Most of this evening was spent watching Brian Feldman "Under the Covers". I didn't linger too long at the event. Once my sketch was done and I had seen all the art on display for the evening, I headed home. Saint Luke's Methodist Church at 4851 Apapka Vineland Roda at Conroy Road has a huge pumpkin patch for the month of October. Saturday was fairly cool so I decided it was time to sketch outside again! I leaned back against a tree and started to sketch. There were more pumpkins than I could count so the task of sketching them all was daunting at first. I also faced the challenge that parents and children were constantly roaming around looking for the perfect pumpkin to take home. Every pumpkin has an individaul personality. Some are short and squat while others are tall and bumpy. The kids tended to like picking out the miniature pumpkins and most parents were focused on getting shots of their children next to the pumpkins. "Look at Mommy, look at the camera. Give me a big smile, come on let me see those chompers!" "Sit over here and I will take your picture with the scarecrow OK?" One child was on a quest to find the saddest pumpkin in the patch, while most others sought out the blemish free perfectly round orbs. As for myself I simply enjoyed the the challenge of sketching the constant parade of young families in the pumpkin patch. On Sunday Winter Park held a Pet Costume Contest. The festivities started at 10 AM and I arrived early. This small section of Garfield Avenue was blocked off and tents lined both sides offering pet photo booths caricatures and many pet related items. At 11 Am the large and mid sized dogs started competing for the grand prize. I found a spot in the shade and leaned back against a dumpster. As I worked flies kept buzzing around and landing on my bare legs and arms. They became quite distracting at times. When the judging started, the dogs that were to go on the stage all lined up in front of me. I think the flies became more infatuated with the dogs and I was allowed to work in peace. The winner of the prize for pet and owner costumes went to the lady who dressed up as the boy from "Where the Wild Things Are" and she dressed her dog up as a wild thing. 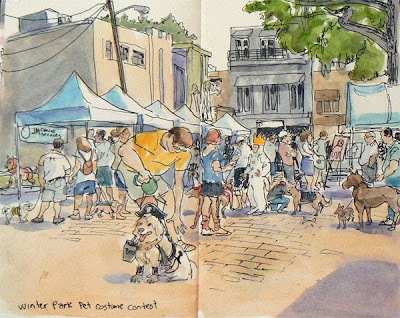 You can see them in the center of the sketch she is in the bright yellow crown. Other dogs were dressed up as bumble bees, pirates, butterflies, Frogs, the imaginative list is endless. Two large dogs dressed as aliens, kept wiggling out of their costumes. They had duck tape holding aluminum around their midsections but the take came loose and soon the dogs had tape on their paws and the aluminum "Suite" was riding half way off their butts. Sketching was a challenge since dogs were hyper to say the least. They were barking lunging and sniffing each others privates. I don't think the dogs particularly cared about the competition, they were just glad to be around so many other dogs. The folks of Winter Park sure love their pets. Costume fittings were held during a shared rehearsal. The director broke the actors up into groups and one at a time those groups would go to try on costumes. At the same time Amy the choreographer was conducting a dance rehearsal in the same Hall and for this reason the director stressed that everyone had to remain quiet. The first group to try on outfits was Egypt, then came the Germanic tribe, Britannia, Africa, the Shepherds and finally India. There was alot of mixing and matching that had to be done, and the director was actively involved in the process. In another rehearsal the entrances of this whole entourage had to be timed and blocked out. The director had Egypt, Africa and India enter the theater from the back of the hall. The Germanic Tribe and Britannia entered from the halls directly next to the stage called "The Bombs". She had different tribes start down the isles at different times trying to get a feeling for when each tribe should arrive at the main stage. Time and again the tribes had to restore and walk their entrances at different paces until their movements felt perfectly choreographed to the music which was "O Holy Night". After many takes, the director said to herself, "I'm starting to feel something, it's starting to get there, slowly." Once again she shouted out "Restore!" The actors of the tribes shouted back "Thank you Restore!" as they rushed back to the back of the hall and the bombs. Then she said "Thank you, thank you." I had to leave before the timing was finalized but with the music it was starting to feel reverent. The Free Fall Music Festival was held in Gaston Park on Lake Ivanhoe. Here Lost Time Accident performs. The event was small in size and family friendly with one of those inflatable kids slides. Two children were playing in the sand of the volleyball court while dad took pictures. Families were scattered about rather far from the stage. Perhaps the music was to loud for them. Right in front of the stage a homeless man sat totally wasted, often with his head drooped down semi unconscious. Several of his friends were better off but also had that glazed look and harsh emaciated skin. But these folks knew how to party. They were dancing most of the time and shouting with their fists in the air. Once in a while the woman in the red top would shake the wasted guy awake and he would listen for a while before fading back out and slumping into a stupor. Half way through this sketch I realized that I was running out of water for my brushes. I went up to the beer tent to get a bottle of water, but realized I had no cash. I asked it they took a credit card which of course they didn't. I had to finish up with some spit to smear the colors around. The girlfriend of one of the performers asked to take my picture while I as working and I agreed. The woman in red came up and looked over my shoulder. The children standing near me backed away. I was afraid she might get annoyed that I had drawn her and her wasted friend. Instead she told me I had a gift from God. When the next act got up, it started to rain. I quickly ran to a small cement power bunker overhang. The crowd quickly disappeared. The singer on stage sang "I'm Singing in the Rain". A hawk on a telephone pole took flight. The woman standing next to me started telling me that she and Jimmy were just recently homeless. They had been staying with a friend but the friend got evicted. All their stuff was at another friends house and she was hoping to get an apartment somehow on her own. Jimmy used to work downtown at a small coffee shop across from the library but he got laid off. When the rain stopped I said good by and stepped out onto the wet lawn. On the way out I bumped into Louis Bova an artist from Brooklyn now living in Orlando. She told me about several other events going on that day, but I had finished my sketch, and I suddenly felt a strong desire to relax at home rather than braving the elements to get another drawing. Doctor G has a reality TV show on the Discovery Channel in which she talks about her job as the Orlando Medical Examiner in FLorida's District nine. I have never seen the show start to finish but I was still curious as to what she would have to say. She was a very entertaining speaker and she outlined how she eventually went on to become a reality TV star. She explained that her first boss was a bit of a male chauvinist so he seldom spoke to her. She also said she would return home each night and talk about her work with her husband but he would interrupt her saying "I know how this ends, they die right?" So she was left with no one to talk to about what she considered a fascinating job. The Discovery Channel called her and said they wanted to do a single program about her work. Suddenly she had an audience. That single program blossomed into a series. The TV program never shows the bodies instead focusing on the dialogue as Dr. G finds the cause of death. Families of the deceased began writing the doctor explaining that they only understood the cause of death of their loved one after watching the TV program. So the program was doing some good. A new medical building is under construction and Sr. G is looking forward to working in the new space. While I was sketching, Bob Kealing local TV reporter for channel 6 came over to say hello. I have spoken to him before at the Kerouac House and he has written a book about Kerouac's life in Florida. After he had finished interviewing Dr. G , he brought her over to where I was still sketching and introduced us. In my usual tactless fashion, I immediately asked her if there would ever be a chance for me to sketch in the Medical Examiners office. She simply and without hesitation said "No". She probably assumed I have a morbid fascination with dead bodies, but all I am hoping for is the next great sketching opportunity. I was invited by Heidi Dog Productions to sketch Pepe and Miss Sammy as they performed Truth or Dare at the Peacock Room located at 1321 Mills Avenue. 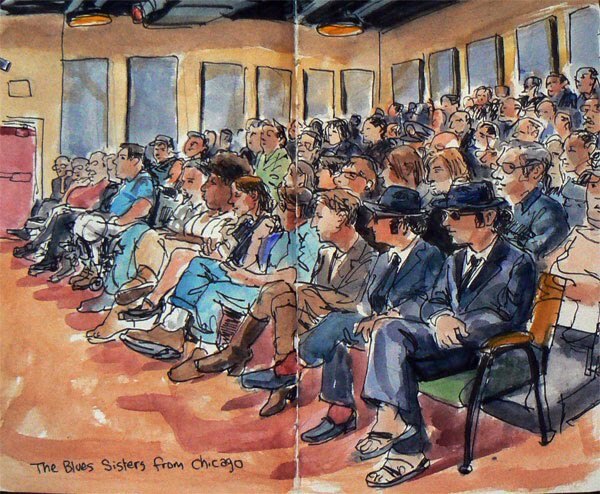 The twist in this strange sketching excursion is that I was to sketch the act from on the stage. After Pepe and Miss Sammy finished their introductions, (It turns out miss Sammy was in La Cage aux Folles on Broadway for 4 years) Pepe had the crowd summon me to the stage by shouting my last name 3 times, Thorspecken, Thorspecken, Thorspecken, just as Beetle Juice was summoned. I hopped up and gave Pepe exaggerated French cheek kisses. Then I sat in a stool at the back of the stage and started to get to work. The first guest to be called up and the one I decided to draw was Jeff Horn. Jeff was fund raising for a charity project he co-founded with Daisy Lynum called Genesis Community Program. This program helps teach young aspiring tennis players the game in the Parramore neighborhood of Orlando. A large jar was passed around to see if anyone wanted to donate. Jeff is also a nationally recognized tennis professional. After Jeff, a politician named Todd Christian was given the Truth or Dare challenge and he ended up putting a condom on a banana with his mouth. Things started to get crazy when Dewey Chaffee and Douglas McGeoch got on the stage. When confronted with the Truth or Dare challenge Dewey made a bold decision to tell the truth. Pepe asked him "If chew could have a one niiight stand with anyone in the room, who would chew peeeck?" Bet Marshall shouted out, "It would have to be the youngest boy in the room!" He chose a young man with very curly hair standing in the back of the room with his girlfriend. Pepe shouted for the young man to come up onto the stage. The fellow looked just like Frodo from the Lord of the Rings movies. He was given the Truth or Dare challenge and the audience gasped in anticipation. He chose a dare. Pepe held up a stack of playing cards and fanned them out. He told the victim, I mean contestant, to pick a card. The contestant was told to pick a card, any card. Before he did, Pepe threw away the 2 of hearts and said, Chew don't need dees card". Frodo picked a five of clubs. He was told that he must remove 5 items of clothing. He removed his shoes which as a pair made up the first item, then his socks, his tee shirt, shorts and finally his underwear which left him totally naked. Miss Sammy and Pepe actually shielded the audience from seeing everything with a leopard skin towel. I didn't have time to sketch the towel, I don't think it is needed in the sketch. I worked furiously to catch Frodo's bottom knowing only the folks on stage could see what was actually going on behind the towel. I am so glad I got a chance to document this strange and fun theatrical experience. I had a blast with my first on stage experience. Before getting on stage for the Pepe and Miss Sammy "Truth or Dare" show, I ordered a Heineken and sat down to do a sketch of this couple sitting at the front table. The Peacock room decorates the place with a real flair. High quality demons and monsters along with cobwebs, were everywhere. I started the sketch because I couldn't help but want to read into what they might be talking about. Based on their body gestures and attitudes, I guessed that they are friends but not particularly intimate. I separated them with the centerfold on purpose to indicate that subtle divide. I also love the fact that they both have monsters lit with complimentary colors, lurking behind them acting as psychological indicators that all is not right. For me the scene has all the elements of an Edward Hopper painting with the added flair of horror. At the bar I bumped into Matt McGrath and he introduced me to Alexis Jackson who is playing the roll of Molly in the play "Love Song" now at the Mad Cow Theater. She told me a bit about the play and the cast and now I really want to see, and sketch it. The show runs through October 25th. Matt said he will hook me up with information about a cool Irish bar with live music that should make for a good sketch down the road. I finished up the painted aspect of this sketch after I was done sketching the Truth or Dare Show then I headed home. The Gallery at Avalon Island hosted an opening reception for No Strings Attached. This show which kicks off the 2009 Orlando Puppet Festival, features work from puppetry artists from around the nation. I particularly like the work of Tamara Marke - Lares. Her work used found objects which were elegantly incorporated into puppets. For instance a crab claw suddenly became a puppets head. Bones, wood, wire and a wide assortment of materials became a character walking across dead leaves. Expect the whimsical and unexpected when you go to see this show. Many of the works have a European maturity about them. These are not the generic puppets I grew up watching. As I stood in the corner of the gallery sketching, a group of school children gathered at the store front window I was standing near. They were hopping up and down trying to see what I was working on. They started tapping on the glass and I decided to show then the unfinished sketch. Jeff Wirth walked up to me and before I recognized him he said, "I am sorry sir, we are going to have to ask you to leave, there is no sketching in this gallery." My stomach tightened before I realized it was Jeff and then I started to laugh. Later as I was finishing the sketch I bumped into costume designer Kelly - Ann Salazar who told me I had to check out the puppet show going on upstairs. I am glad she did because the shadow puppet show was delightful to watch and I got to sit right next to the puppeteers as they worked. I had to run off to another event so unfortunately I didn't get a sketch, but I might return. With my sketchbooks tucked away, I finally decided to get some cheese and crackers which was to be my dinner for the night. Here I ran into Heather Henson who had just returned from months of wandering the country going from one puppet festival to another. She told me about the Burning Man event held in the Black Rock Desert 120 miles north of Reno Nevada. It is hard to describe burning man but it is the ultimate in large scale creative expression. Going to this event is one of the things on my list of places I must go to before I die. 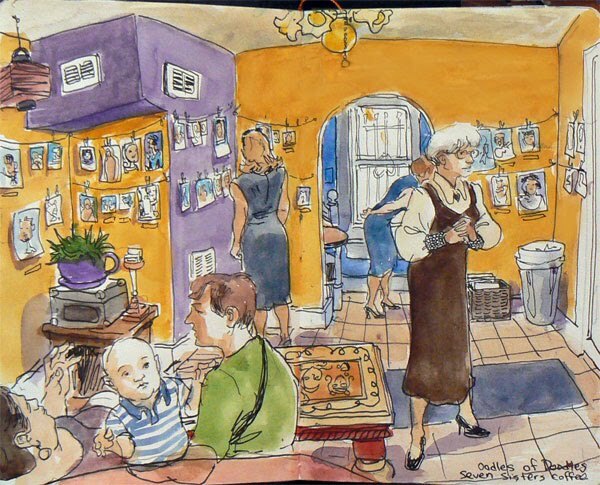 The Avalon Gallery hours are Tuesday through Thursday 11AM to 4PM. There are also some very cool shows coming up like Macabre Vignettes and "The Bride of Wildenstein" the musical on October 29th-31st ,10:30pm at the Cameo Theater, 1013 East Colonial Drive. Tickets are $10. The Interactive Performance Jam coordinated by Jeff Wirth and directed by Curt del Principe was a fun acting workshop held at the UCF Center for the Emerging Media across from the Bob Carr. I asked the guard in the lobby where I could find the Jam and he sent me up to the third floor. When I exited the elevator I heard Dean Martin singing in a room down the hall and I headed towards the music. When I entered the room I noticed it was divided into 4 areas with different tasks for each area. I sat down and immediately started sketching Jeff who was in the tech talk area demonstrating the Union Wrap. The Union Wrap is a way to coil electrical cords which keeps the cords from kinking. If the cord is coiled the way I usually do it by wrapping in around in one direction, it develops a memory and this is what causes the kinks. The Union Wrap reverses the direction every other wrap. When Jeff finished his demonstration he threw the cord allowing it to fully unwind and then had a fellow actor give it a shot. Other stations included, a character interview where one actor would interview another developing an improvised scene. There was a coaching station where actors would coach each other. Then there was the fundamentals station where actors would build and maintain the basics of an improvised scene. There were card stacks which provided actors with a scenario, character or location as a starting point for a scene. I watched Jeff and Curt work together in the fundamentals booth. Jeff walked into the scene just as Curt was about to hang himself. The distraught character was angry and acted much like the Rain Man. Later in the ongoing scenario, Jeff tried to convince the man to give him an imaginary knife he was holding. Jeff ended up being stabbed in the chest and yet he continued to try and sooth the angry man. This scene seems to hint at the kind of man Jeff is and why he is inspiring to be around. Half way through the jam I was asked to talk a little about my work and I was honored to do so. Jeff interviewed me so I didn't just have to start pontificating, and he asked the most probing questions which forced me to truly get at the heart of why I do what I do each day. His first question though innocent enough caused me to look hard at what caused me to start making art to begin with. Memories flashed of me as a child driving with my dad to visit my mother in Sloan Kettering Cancer research hospital in NYC. I was a suburban kid shocked by the grit of the city, a rush of activity on the streets seen out a car window, kids riding on the back bumper of a bus. 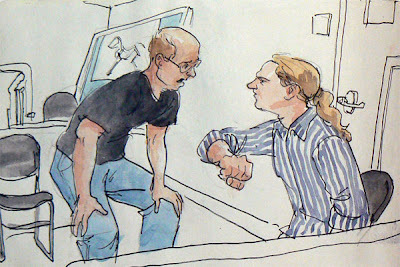 I wasn't allowed up to the hospital room to visit, instead I drew pictures which were never seen. Enough of my scenario, back to the Jam. When the Jam had ended, all the actors gathered and sat on the floor in a circle. This was an open discussion on how to make future Jams even better. Some actors tended to want to focus on dramatic scenes while others preferred light comedy. One actor felt this dichotomy resulted in a gradual lack of focus among the group. Dana Mott liked being pushed to be physically connected with her acting partners, which forced her outside her comfort zone. All ideas were encouraged. The Jam will continue to explore new ideas and theories, uncertain how they will work until they are tried out next time around. It is this playful spirit of experimentation that keeps the Jams exciting and vibrant places to learn and grow. Getting close to the unfolding dramas also makes it an exciting place to sketch! Here Suzanne the choreographer leads the core drama and dance group in a high tempo sort of jazzy rendition of "Ring Those Bells". This is an over the top Broadway dance number with lots of jazz hands and fancy footwork. There was plenty of excited energy as everyone learned the steps. Suzanne said that everyone should try and keep moving through the routine even if they miss some of the steps. There would be plenty of rehearsals to come where the details could be refined and worked out but for now she wanted to block in all the moves and keep moving forward. The group started as a large triangle and then split into two halves before rejoining and ending with everyone striking a dramatic pose then stretching that pose further reaching for the sky. Suzanne had to work with the core dancers in another studio and at that point Aradhana had Rebeca come to the front and take over the rehearsal. Rebeca did a great job of getting the group to really stretch and expand their capacities in one that one part of the routine. Later when Suzanne returned and asked everyone to go through the number one more time she was shocked and grateful for the improvement. When the rehearsal ended everyone joined hands and Suzanne prayed for relief for any aching muscles resulting from all the stretching and dancing that day. She asked that everything learned would stay fresh in everyone's memory and that they all gain confidence as they continue to practice at home. She then asked that everyone be guided home safely. She stressed that her heart was overwhelmed with gratitude for all the hard work and joy expressed in the days work. The Friday night performance of the 6th annual All Hallows hosted by Beth Marshal was completely sold out. All Hallows is a fund raiser and benefit that offers 10 plays from Fringe acts each taking about 10 minutes. The event cost just $10 and helps raise funds for next years Fringe Festival. People were encouraged to wear costumes and the top prize for best costume was a 2010 Super pass for the Orlando Fringe Festival. At 7Pm there was a reception in the patrons room with food and drink as well as a silent auction with such items as tickets to theaters museums, art work by local artists, the list goes on. In attendance at this nights performance were representatives form various cities who are members of the United States Association of Fringe Festivals. This event offered an amazing variety of fabulous entertainment. One of my favorites was a scene in which a wolf man and a cross dresser sit on a park bench and they both discover that their partner has certain secrets. Chantry Banks played the wolf man and he didn't utter a single line of dialogue which is very refreshing. Christopher McIntyre as the cross dressing fiance was also over the top funny.I was laughing out loud the whole time. Lindsey Cohen presented a short film about an old couple who are using youtube to try and raise funds for Halloween candy for their diabetic child. It was fun watching them bicker and fight revealing the worst in each other. Since the place was packed, I sat on the sidelines and looked away from the stage at the audience. There is one more performance Saturday October 16th at 7PM at the Shakespeare Theater. I believe there are a few tickets left. For advance reservations call the Fringe office at (407) 648-0077 (MC/Visa). Cash Only on the day of event. Box office opens at 6pm. Trust me these are the hottest tickets in town. This show is a blast. Barnes and Noble at the Colonial Plaza Market Center had a meet and greet with the cast of Fiddler on the Roof. I have seen this show before and loved it, so I was curious to see what the cast had to say about this "Farewell Tour." I had also read an article that said that Chaim Topol did an amazing part of playing the lead part of Tevye the Jewish Russian milkman. Topol was in the 1971 film version of the play and had performed his part more than 2,500 times over the years. Topol's understudy was at the meet and greet. The shows theme of Tradition, rings true today more than ever. Times are hard but people with strong traditions know how to ride out the waves. I was surprised that the seats were half full. The last time I came to one of these meet and greets, the place was packed to see the cast of Legally Blonde. I was also interesting that one actors chair remained empty much like the place setting that remains empty for the profit Elijah at Passover. The actors related the types of routines they go through in order to prepare each night for a performance. One actor stressed that "Every actor has something they do to get out of the way of the material". He said "You have to let go and surrender to the play." They all had hard knock stories about trying to get into and stay in the business of acting. When asked about any embarrassing moments, a story was immediately thrown out from last nights performance. The set pieces are on wheels and some have pneumatic pistons for helping move parts. That night a piston let out a long winded hiss of air which sounded very much like a person passing gas. Rather than ignore the loud unexpected distraction, the performer paused for a moment and then sniffed the air and waved his hand as if to clear the air. The audience loved it. This event was over much sooner than I expected so I had to dash this sketch off quickly. I didn't stick around for the autograph signing since I had to rush off to another location to get another sketch. 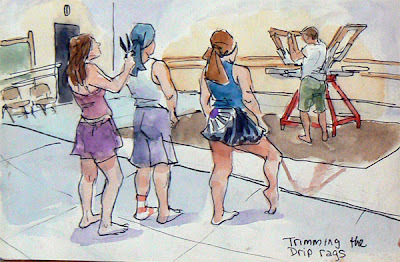 When I entered the Center of Contemporary Dance where the DRIP dance group was rehearsing, I saw a huge screen printing press in the middle of the dance studio. The idea behind the dance routine they were working on, was to use the screen printing press to print images of dancers on the cakes which were to be served for desert at a private event held in a gallery downtown. After saying hi to Dave and Samantha, the two dancers I had met at a photo shoot the week before, I sat down to start sketching. The press had to be moved back away from the mirrored wall. Four dancers grabbed the press and moved it together as a unit. David said, "We are like an ant colony, yall!" When rehearsing the dance, Sam is in charge of pouring the inks onto the screens and the other dancers use squeegees to force the ink through the screens onto the cake. Afterward she asked, "So, do I have time to disperse the juices?" The response was, "Yes, you never want to disperse the juices to fast." Prior to another dance run through, Marika shouted out "Did you all hear what Christie was just saying? There are five different art forms going on in the room right now." I started to wonder what those 5 art forms were. Obviously dance would have to be one. I was sketching, so that was two. Twanda had entered the studio and she was sitting in the far corner of the dance studio making adjustments to costumes, so that is three. Evan and Christie were painting signs among other things and Linda was making sure her choreography was on the mark. When the dancers worked "All out" Linda would shout at the top of her lungs thanking the dancer that was pushing the envelope. During a break, David said "I am going to be dreaming about this unit." Sam said "It's so big." David followed with "That's what she said." The group the dance troupe was to perform for is apparently rather conservative. For this reason none of the dancers could just wear skirts. Black tights had to be put on to cover their bare legs. While restoring , David shouted out "We have a vision here, You are not fulfilling it! Lets go people." He is never serious and everyone always laughs. Maybe you had to be there to get his humor. Mariko asked that the dancers go through the routine one more time this time using the inks. Drip rags were placed over the dancers heads and trimmed. Everything was going great up until the dancers got ink on their hands. Suddenly paint was flying everywhere and the dancers had to be stopped. The drips had flown well beyond the confines of the drop cloth placed under the press. Soon everyone was on hands and knees cleaning the dance floor. Mariko said "Well, at least we found this out now, rather than during the actual performance." It was decided that this one performance would not need to have inks on the dancers themselves. The point was to make the printing of the cakes entertaining. They didn't want paint flying onto peoples dinner tables silverware and plates. The dance performance combined stretches of choreography with stretches of pure improvisation. The improvised segments were different each time and inspiring to watch. DRIP has its first performances at Blank Space TONIGHT October 15th at 8 and 10PM! Blank Space is at the corner of Roslind and Central right across from the Public Library. You can actually see the performers through the store front windows. DRIP will perform in Blank Space every Thursday, Friday and Saturday at 8 and 10PM. I went down to Baldwin Park to see the Global Peace Street Fair and Pet Parade. The event was sponsored by the Global Peace Film Festival which ran from September 22 to September 27th. 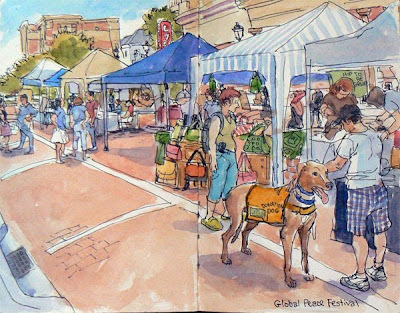 There were a large number of tents set up down Broad Street featuring art, wholistic foods, animal rescue and semianrs on how to be a catalyst for change. I walked up and down past the booths twice before I decided I had to sketch the Greyhounds who wore bright yellow vests that said: Donation Dog. A clear pocket on the vest held dollar bills that guests had donated to the cause. It was hot and the dogs tongue was constantly panting to try and cool down. A fellow named Rick introduced himself to me and he has been reading this blog for some time. I am always surprised when people recognize me. I am so pleased to meet people who are actually following these random thoughts and sketch outings. The pet parade strutted up and down this small stretch of Broad Street first up the far side of the sidewalk and than up and around behind me back to the starting point. Women dressed like belly dancers paraded along with the dogs and owners. The people of Baldwin park certainly love their pets. If only people could openly love one another as much as they love their pets. Peace and love, I am out. 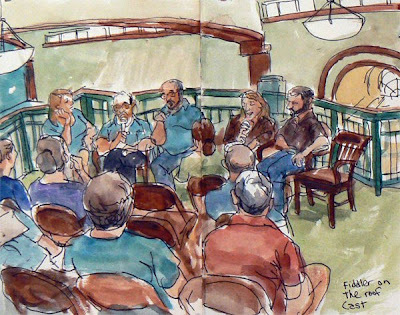 The Annual Meeting was held in Courtroom B on the third floor of the historic Orlando Regional History Center. This meeting was short and to the point. As a matter of fact the meeting was over before I had a chance to finish the sketch so I had to rush. Johanna Clark called the meeting to order and introduced the gusts who were the family of James K. Rush. The 2008 minutes were approved and then old business was discussed. The treasurers report probably took the most time and the bottom line is that the History Center is operating in the green with assets of just over a million dollars. Several motions were put to the floor and the members all sheepishly approved each item. All board members, the executive committee and the treasurer were all approved back into position. There was no items that required discussion and no dissent. One small tidbit of trivia intrigued me when the Executive Director pointed out that the first film ever shot in Orlando was called "Moon over Orlando". She hasn't been able to find a print of that film and I wonder if it will ever pop up. 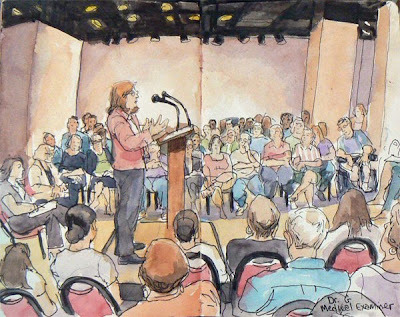 I was still splashing watercolors on the sketch when the meeting adjourned and people made their way out. Sara asked if I would be much longer and I said I would be finished in 5 minutes. She said I could always come back to finish up. 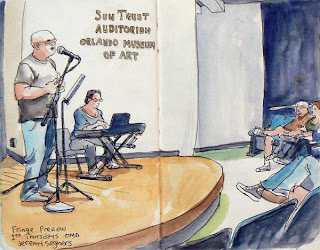 At the first Thursday of this month Brian Feldman held a cabaret by request called "Under the Covers" at the Orlando Museum of Art. Back on the first Thursday in May, Jeremy Seghers performed, an act by the same name, singing cover songs requested by the audience for a Fringe Festival Preview. Brian used Jeremy's performance as inspiration to literally go under the covers. Accompanying Brian was Isaac Schankler on a Kurzweil SP-76. The performance was developed and first presented in July of 2009 at the Atlantic Center for the Arts in New Smyrna Beach Florida. When the audience entered the theater, they could faintly make out the form of Brian lying under the covers on a mattress on stage. Isaac introduced the act and sat at the piano. Brian explained that he didn't actually sleep on a mattress himself, but instead slept on the floor of a friend's house. He was recently separated from his girlfriend, Jessica, and many of the songs in his first set seemed directed to her. An unexpected development towards the end of the first set was that Jeremy Seghers got on stage and joined Brian to sing a duet. At first, Jeremy just sat on the bed next to Brian's form hidden by the covers. Then, Jeremy lifted the covers and joined Brian underneath, singing "I Guess That's Why They Call it the Blues". This song was a show stopper. I returned to see his second performance which featured a Queen song requested by Katie Windish from Frames Forever titled "Fat Bottomed Girls". Don't ask why she needed to hear that song at this time in her life. After the last song, Brian had to explain that the performance was over since he was still on stage, though under the covers. I am sure some people like myself lingered to see the performance artist in person. But Brian consulted with stage hands and shouted out, "No really, the show is over! Get out of here, people!" When everyone had left, he sprinted into the wings. The second rehearsal I attended was with the core drama group. Aradhana, the director, got things started by having the actors walk on a grid inside the taped off area that outlined the dimensions of the stage. She said "Stop thinking, let things happen naturally in the moment." I find myself looking to stop thinking and analyzing as I try and loose myself in a sketch. She then asked the actors to "explore gesture, and think of the space you are moving through." "What are the spaces you explore?" My sketches of this show are suddenly exploring larger and more grand vistas. She then asked them to adjust their tempo. She didn't want anyone moving at a medium tempo she wanted to see the extremes. Some actors moved imperceptibly while others were close to a run, actually Rachael was running. The director said "find something about someone else to copy and make your own." Then she asked the actors to gradually over time to discover one movement where everyone moved as one organism. This is the aspect of the exercise that always amazes me. after a while the whole group was holding hands and moving side to side. Hands went up and down in a wavelike undulating pattern around the circle. The actors were then given the cure to break away from the group when they felt like it. Music was added into the mix and soon actors were snapping fingers and moving with the grace of dancers. As the music built in tempo the actors were jumping and swaying to the beat. The director had everyone sit down in a circle. She pointed out that everything in theater is created to build tension between characters. She said that the largest motivating factors are always about love, war or spiritual concerns. The actors were separated into 8 groups. Each group was given a scenario to act out. The actors were given free reign to act the scenes out as they saw fit. The room bustled with creative energy. They were given some time to discuss how they might build their scenes. Then one by one the scenes were staged with the remaining actors seated around the director to enjoy the show. There was loud applause and often laughter after the director ended each scene. She then offered suggestions on how to pace the scenes faster with more motivation. On the second run through the scenes were almost always clearer and more entertaining. This was a pure joyous game of inspiration and motivation. The director pointed out that notes are not a bad thing. She asked that once a note was given that the actor say thank you and repeat the note so she knew they had heard it. The scenes were, City People, Airport scene, a loving couple, fighting family, diva desert, decorators and carolers. Once all the scenes had been rehearsed individually, the director asked that they overlap the actions on the stage just as they had in viewpoints. She would cue the next scene when she wanted them on the stage. This was tried a number of times and then the song "The Most Wonderful Time of the Year" was added. Suddenly the scenes flowed with the music choreographed by pure instinct. The director shouted out "Alright everybody one more time, Restore!" The actors all shouted back "Thank you Restore!" I have been offering people who purchase sketches from me the opportunity to have the art framed by Katie Windish at Frames Forever & Art Gallery 941 Orange Avenue in Winter Park. Katie has made her shop available for several of Brian Feldman's performances such as "Sleepwalk", and "The End of Television: PartIII". Since she supports the arts in this way, I have decided to use her services exclusively. On my second trip to the shop, I asked Katie if she would mind me sketching her at work. If you look in the mat she is placing, you will see one of my theater audition sketches. Katie works fast. She had the mat cut within minutes and then went on to build the custom frame. She cut lengths of the black wooden frames on a table saw with a vacuum sucking up the dust automatically. The cuts were then sanded perfectly flat and everything was set to assemble. She glued the wood frames together and held it tight with an adjustable strap. When the glue was set, she nailed the frame together for added support. Her dog, Lucy, checked up on me several times as I sketched but since I didn't lavish any attention on her, she wandered to the back of the work room and watched me for a while. Lucy is Katie's security dog and I am sure she was devising some way to get me kicked out of the shop but her eyes got droopy and she fell asleep. Katie is a whirlwind using every corner of the shop as she assembles a frame so I drew her 3 separate times in 3 different locations before I decided to lock her into the position she holds in the sketch. Katie's small intimate shop is always a pleasure to visit. If you are looking to frame anything, I highly recommend heading down to Frames Forever. Patricia Smith, four time winner of the National Poetry Slam, gave a talk at Bush Auditorium at Rollins college. She began her reading with the poem Building Nicole's Mama. Listen to the audio clip on the link. Patricia stressed the any aspiring poet or anyone who loves poetry should spend as much time as possible listening to the authors of the poems reading their own words. It offers a chance to hear firsthand the authors intent and meaning in tone and pacing. The child's hunger to recover from loss is primal and hit me in the gut waiting to recover my breath. All of her poetry hit with the same force. She read several poems about Hurricane Katrina in which she personified the storm and then in another poem she gave voices to the 34 nursing home residents who were left to die in Saint Bernard's Parish in New Orleans. The poem had 34 stanzas which bought to light each residents thoughts and hopes as the storm approached. In a question and answer session afterward Patricia stressed the importance of getting at the truth. She said authors should not write around issues or conflicts but be honest with themselves facing the truth head on. She stressed that you don't want to get to the end of your life and realize that you had not taken every chance to be completely honest in your writing. Can a sketch ever have the emotional impact of poetry like Patricia's? I am not sure but it is certainly something to aspire towards. I first met Jessica Mariko the Executive Producer and Creative Director of Orlando's Drip Dance and Visual Arts Performance Group at an event called Ignite Orlando. She performed an amazing dance piece with music and narration that shed light on the creative process. The dance company is about to begin performing at the New Contemporary Art Lounge which is right across from the Orlando Public Library. Performances will be on the third Thursday, Friday and Saturday of each month. This photo shoot is for a huge billboard image that they will install on the front of the building. The shoot was in a quiet suburban neighborhood. When I walked up to the address I wasn't sure I was in the right place, but there was a crowd of people in the garage so I walked in. People were hanging plastic drop cloths everywhere and the floor was also covered in plastic. As the photographer, Tisse Mallon, got the lights and background scrim ready, the art directors, Evan Miga and Christie Bock cut up swaths of fabric into drip rags which would be used by the dancers to cover their hair. The shoot started slow enough with shots taken of the dancers without any paint involved. Then things got fun when the dancers dipped their hands into the cans of latex house paint. The paint was bright blue and bright orange. The dancers posed separately at first and then they posed together. As they worked they got more and more covered with paint. The poses that seemed to work best for the horizontal format of the final image involved the dancers intertwined and reaching as if struggling to grasp something. The male dancer said "What if I bent back on my knees and she was almost flying?" All suggestions were tried. The shoot was a constant collaboration between the photographer, Mariko and the dancers themselves. Mariko said " I like the idea of the two of you throwing paint together." The female dancer had an expression on her face that Mariko tried to define, she finally decided "Keep that look, it is an artsy confident look." When the dancers were drenched in blue and orange paint, the art director decided to add black paint into the mix. When paint was poured on the dancers they would scream since the paint was rather cold. It would drip down under their skin colored leotards and settle in uncomfortable places. As the paint started to dry on the dancers skin, it began to peal away like a bad sunburn. My sketching became more frantic as the shoot progressed. I started slinging down washes and dripping paint on the page. I was inspired my all the activity and dripping paint which was splashing everywhere. Everyone was laughing the whole time. I am sure that sense of fun and play will shine through in the final billboard image. When the dancers were finished, the art director and designer started just splashing paint around to get shots of paint flying through the air. 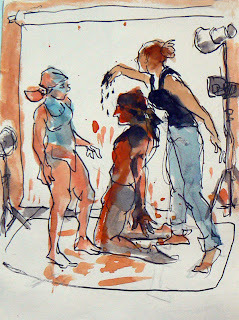 I hope to sketch rehearsals by this dance company whose performances are sure to inspire. Holy land has been locked in a dispute with Orange County property appraiser Bill Donegan over whether it deserves to be tax exempt. Since it is a "Church" they are required by the government to provide one day a year free admission to the park. In the past the free admission day was never publicized. For those who might not know, Holy Land is an Orlando Christan Theme Park where you can watch singing and dancing Israelis, see Christ drag a cross through the streets of Jerusalem then even watch him get crucified. Having never gone, I figured it might offer some interesting sketch opportunities and for free! As I drove up to the park I was shocked to see a long line of cars perhaps a quarter of a mile long snaking out of the theme parks entrance and over the I4 overpass blocking traffic. I only had a two hour window in which to sketch so I didn't want to wait in that insane line. I drove around the block approaching the park from another angle.I saw cars parking in an empty lot across the street from the park and I figured this must be overflow parking. When I walked through the gates I passed a man handing out park tickets but didn't pick one up since I only planned to sketch the long line of people waiting in line. The crowd inched forward at a steady pace with the end of the line nowhere in sight. The Star Spangled Banner was being sung inside the park and all the excited activity made me feel like I was at a baseball game. A woman walked past me and said to her son, "Look he drawin!" A familiar song caught my ear "This little light of mine I'm gonna let it shine" I drew to its beat and it inspired me to draw faster. The police man I was sketching walked up to me and I braced myself, he said, "Look at me, I made your sketch better." As he walked away he said, "Hey you want some water?" I said I was fine. I probably should have accepted his offer since I was sweating like a wet sponge. I was sitting directly in the scorching Florida sun. Then suddenly the park gates were closed. The parks capacity was 1,700 people and they were full. Outside the gates the gathering and ever growing crowd pressed forward. Police whistles were blowing constantly as officers tried to get the cars to keep from blocking traffic. A news helicopter swooped in and started shooting footage of the growing crowd. It was starting to sound like a war zone. 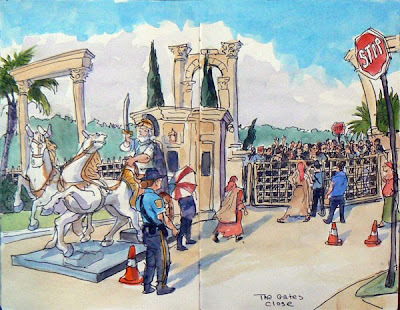 The officers started shouting that the park was full and there was no point in waiting at the gate. I started to imagine that the pearly gates of heaven might offer a similar scene of confusion. Later a parks person drove up blocking my view with his huge SUV. He advised that park tickets be offered to the people outside the gate for any day in the rest of October. For some reason the people were then allowed in the gate and then told to exit through another gate. Many people given tickets didn't speak English, so they started walking toward the parks turnstiles. Park workers had to shout out that the tickets were not good for today, but since the guests didn't understand, they continued on their merry way. The scene was constant chaos. When the crowd was finally dispersed and the scene returned to normal, a new Lieutenant was posted at the gates and his first order of business was to get the female officer to tell me to stop sketching and leave the park. I was just about finished with the sketch and I asked her if I could have just 5 more minutes, as I talked to her I continued to sketch. She said, "I like the sketch and if it was up to me I would let you stay here as long as you want, but I have my orders." I quietly packed up my things. I am starting to feel that I haven't covered an event until someone forces me to leave. As I was exiting the female officer thanked me and I said "Have a good day." Inside of course I was fuming. I had a job to do as well. When I got back to my truck, I found a parks person taking photos of the license plate of the car parked next to me. As I drove off I hoped he hadn't taken a photo of my license plate and now I am wondering if I will get an expensive ticket on top of getting kicked out of Holy Land! I doubt I will ever want to return to these pearly gates. Dawn is an illustrator and mother of 2 children. When her youngest went to school Dawn decided she wanted to get back into doing more illustration work. She had been away from illustration for years and wanted to get back in. Her father was an early adopter of high tech gadgets and he got her interested in Twitter. This introduced her to the new world of Social Networking. Twitter however didn't satisfy all her needs. Mark Zuckerburg turned her on to Facebook and helped her set up a the Dawn Schreiner Illustration Group page. This is where the art for this show began to be created. A member of the group named Debbie suggested Dawn sketch all the members of the group. Dawn started doing doodles of the members with the goal of doing one doodle a day. When Dawn started creating these sketches, she had maybe 20 members on the page. As the project progressed, that number grew to 50 then 100 and now it is at about 200 plus members. As the number of Doodles grew so did the number of members so that Dawn may never complete the task. All of the doodles are done on recycled materials. One piece was on a brownie box and another on a Cheerios box. I found myself wandering through the show checking the backs of each piece to see what art supplies I might be throwing away each day. The show is an absolute delight with bright acrylic colors thickly applied and expert draftsmanship in every piece. Many doodles are fun and quirky with flowing and spontaneous use of line. The show was simply hung on wires with each doodle secured with a clip. Work was flying off the walls at the opening, it is very affordable. I myself am considering going back to get a doodle with my name on it. Having just attended a Social Networking conference I am inspired with how Dawn used Facebook to market her work to an exciting new network of friends. The show had a web cam set up for the duration of the opening so it could be shared with out of state members. I called my wife and told her she had to come down to see this show and I will tell you the same. Head on over to Seven Sisters Coffee House at 911 North Mills Avenue a few blocks north of Colonial. The coffee is delicious and the relaxed setting is a great place to sit back and read or surf the web. Tell Alisha that I sent you! I just have to write another post about IZEA fest. 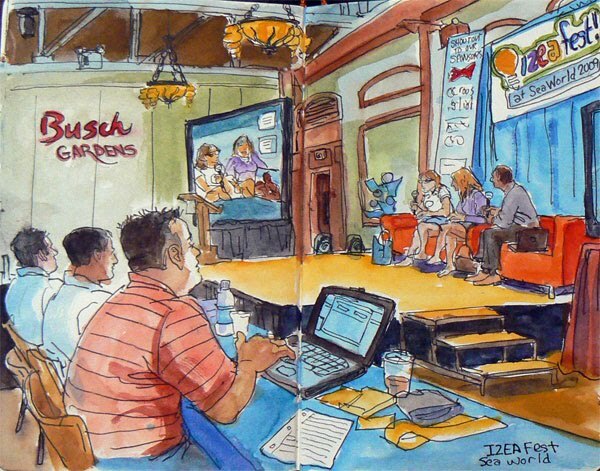 This sketch is of a panel discussion with Sarah Austin and Julia Roy. Sarah who has just moved to LA is an online life caster who interviews tech-oriented developers and Julia hosts a Twitter news show called Tweet Week on YouTube. However what I want to share is the inspiring comments from Aaron Brazell, founder of technosailor, the keynote speaker at the event. Aaron offered his insights in short concise tweet like bursts. His primary point was that bloggers have the ability and responsibility to help change a community and affect people in a positive way. He particularly wanted to point out that this influence is much different than celebrity. He said some bloggers have a Rock-star mentality that attracts attention for a short span but a true influencer gets attention for the long term. Someone who is an influencer is hungry all the time they always want to learn more. He told a short story about a hermit in ancient Greece who had a thirst for knowledge. He was socially awkward but studied constantly. He ended up teaching at the Great Library of Alexandria and went on to invent Geometry which is the cornerstone for most every modern advancement. His name was Euclid. The point being that hungry people change the world. Whatever your area of expertise, dive in and dig deep to find its inner workings. Always stay hungry. He said that an influencer should offer information in an environment that makes people want to come back every day to find out more. They should always be consistent they should offer thoughtful responses not knee jerk reactions. Their is no point to divisive arguments. To many people today are always ready to pick a fight. They should instead offer quality insights. An influencer needs and should seek out allies. They should find people who are supportive of the same cause and issues. An influencer needs to do what they say and say what they do. People need to trust what is said. The primary function of a blog is to interact, make friends and influence people. They should create something for the community bringing others into the spotlight. The point being to build others up and inspire them to bring out their best qualities. An influencer is often unsung. They believe in what they are doing, they love doing it and they just do it. Often they doesn't even know they are influencing others. Liz Strauss gave a talk that was just as inspiring. She said that with all the digital discussions going on, that we are more connected than ever and yet all so alone. She said that when you feel alone you should reach out and help someone else. She also pointed out that a blogger should encourage the followers of a blog to comment. A blog should not be a one way conversation. The early followers of a blog are very much a part its growth and development. They are part of the barn raising of the blog. My head is spinning from from all the insights and inspiration offered. I seem to be experiencing what Liz called the euphoric enthusiasm of the beginner. She said that phase in a bloggers development usually fades after 5 or 6 months. I am at 10 months now and the enthusiasm just seems to keep growing. She claims that every blogger then experiences a period of disillusionment. I hope to coast past that road block with hard work but now I am braced for the inevitable fall. I hope she is wrong. When I entered the First Baptist Worship Center, Aradhana, the director, had everyone doing a rather fun exercise. On one side of the large room individuals were holding 4 signs , Strongly Agree, Agree, Neutral, and Disagree. She asked simple questions and everyone was asked to run to the sign that matched their answer. For instance she asked " Is Christmas your favorite holiday?" Most of the crowd of actors ran toward "Strongly Agree" with the children running the fastest. After a long list of questions people were getting tired. She explained that the exercise was used to point out how we are all individuals from different backgrounds but as a group the core values are very similar. A large staging area was then set up in the middle of the room with 4 chairs marking the corners. What followed was a viewpoints session exploring time, space, shapes, tempo and pacing. The actors were asked to walk the space in a relaxed neutral pace. Then the director would make suggestions which affected how people walked. For instance she said " Imagine you are walking to work to quit your job." "You are walking in the airport to be reunited with the love of your life." She advised everyone to be aware of the space around them. She wanted then to fill the space as a group. Then she asked the actors to either walk very fast of very slow. She then told everyone that "You are going to meet the Messiah." At this point an actress came to the corner of the space where I happened to be sketching and she knelt down in front of me. Others joined her and soon there was a crowd of worshipers before me. They were all looking at a point just above my left shoulder. I had to turn to look. There was nothing there. It was as if they all saw someone standing right behind me and I just didn't notice him. If he was looking over my shoulder, I hope he liked my sketch. Next the actors were asked to only walk in a grid pattern. She asked "How do others movements affect your own." "Discover gestures or shapes as you explore the grid." "Get addicted to copying something about someone else." Soon pairs and then small groups were imitating each others movements. She asked the group to gradually find a group leader. Over time the group started to move as a whole like a flock of birds. Slowly everyone formed themselves in kneeling fetal positions. Then one woman rose up and started snapping her fingers. the energy of the group built with everyone snapping their fingers and joyously dancing around the space. The fact that professional dancers were in the group made the groups movements fluid and beautiful. Something choked me up about this unrehearsed spontaneous expression of joy. When the exercise was over she explained the viewpoints helps actors look at the bigger picture rather than focusing on the self. For long periods she was silent. She explained that during those times the actors are forced to stop thinking and just be. As a group the exercise helped build trust among the actors even though they had never worked together before. I got an e-mail from Bob Kodzis founder of Flight of Ideas about IZEAFest which is a a conference by bloggers about blogging. Bob went out of his way to get me a ticket to get in and I am eternally grateful. I found myself in a huge room full of people who love blogging as much and perhaps even more than I do. I felt a little out of place since I didn't have a laptop, just my paper, pen and watercolors. But when all was said and done I had to rush home in order to share the joy and excitement of the event thanks to the miracle of blogging! During the presentations two screens had a constant stream of Tweets scrolling by in real time. This was at times distracting and yet very humerus since candid remarks have a tendency to sometimes get out of hand. Lets face it bloggers are a fun group to hang around with! One concept thrown out that intrigued me was the need to write up and define a "Hedgehog Concept" this should be the one thing that you are the best at in the world. It is also important to know who you want to communicate with. A common theme throughout the day was to give before you expect anything in return. At lunch time Sea World gave a presentation explaining how they market their theme parks. I didn't pay very close attention since I was sketching but near the end of the presentation I heard a trainer shouting out "Come on Clyde this is your chance to shine!" Down the side isle I saw a huge Sea Lion ambling his way up to the stage following his trainer. However when he got to the stage he decided he had had enough of the bright lights and crowded room and he turned and started heading back to the exit. The trainer tried to convince him to go on stage but the sea lion outweighed the trainer by at least 500 pounds so he got his way. He still got a standing ovation. The final panel of the day was very insightful. Warren Whitlock pointed out that the main function of a blog is often to promote other people. This goes to the heart of what a blog is all about. Blogging is all about giving. It is only when you are truly giving that the tools become important. Chris Heuer tried to sum up blogging with this simple series of words... look, listen, learn, join, lead. Whereas Warren summed it up more concisely... listen, love. He said blogging is all about wanting to be a better person and caring. The next century is about listening. How can I help people and how do I connect them? As Sarah Evans said " Social Media is a conversation, maybe we should talk." 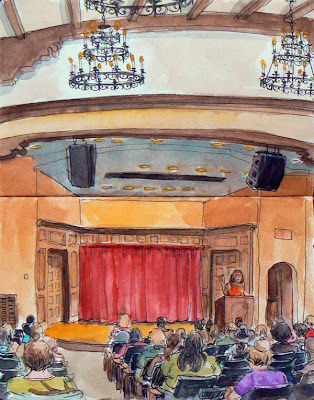 This inspiring conference suddenly made me feel like I am part of a much bigger online community and that blogging might be about much more that just sharing a sketch a day. On the drive home James Taylor was singing "Shower the people you love with love." I suddenly realized what blogging is all about. On Thursday I went downtown to see the opening for an art show titled "Dresses" as Avalon Gallery on Magnolia. This show produced by Donna Dowless featured paintings sculptures and mixed media from a number of contemporary women artists. I arrived early and wandered the exhibit in a relaxed setting prior to the crush of the crowds. The exhibit had paintings of dresses, welded metal sculptures of dresses, and of course actual dresses. I like one piece that had a shadow box with a crumpled napkin inside, and on the glass surface of the box a dress was drawn inspired by the abstraction of the napkin. 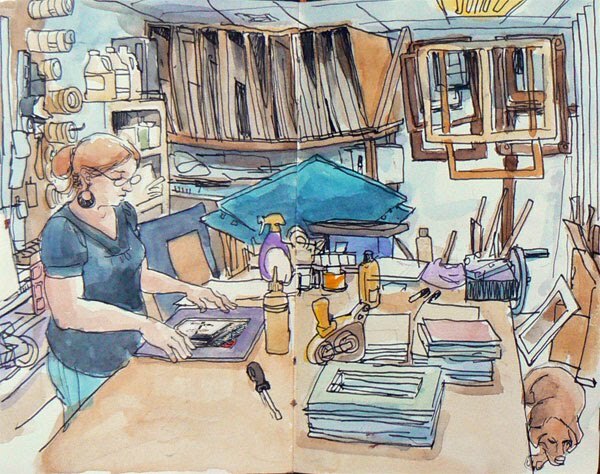 I was pleased to find work from Dina Mack and artist whose work I have come to admire from sketches I did of "A Confluence" and her magical journaling workshop. Her work had tiny 2 by 3 inch panels with butterfly wings glazed into them. Cellophane and other materials were also layered into the pieces. I picked out a comfortable chair at the back of the gallery and started to sketch out the perspective of the space. I was right in front of a false wall that art work was hanging off of. As the gallery started to fill up, members of Voci dance showed up and went into the women's room to change into their costumes for the night.They came out and dances elegantly around the space until the room became to crowded to move around in. This sketch was a major challenge. I found I would barley have time to see a person then they would disappear behind someone crossing in the foreground, never to be seen again. Several artists and friends I had sketched introduced themselves to me. A waitress from the Social Chameleon introduced herself to me and after a second I recognized her since I had sketched her a few nights ago when I sat alone at the Chameleon taking in the ambiance. My attention was constantly being fractured and re focused. People must truly think I am rude as I keep sketching even when in a conversation. Halfway through, I almost gave up , but a fellow artist who sat in the chair next to mine asked to see the sketch book and she pointed out the aspects of the sketch that were working. When she handed the book back, I decided to keep forging ahead despite the constant flow of humanity. I am glad I stuck it out. This is rougher than I usually work and the evident struggle adds I think to the sketches character. 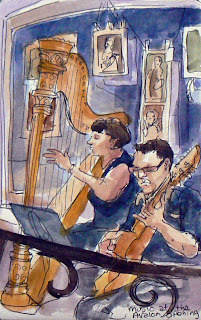 When I finally finished this sketch, I picked up shop and went to watch a harpist and guitar player in the next room. It was past 9 PM when the event was officially supposed to end, but I decided to sit down and do another. This sketch came effortlessly. Then I put the sketchbooks away and talked to friends who stopped over to say hello. I've never enjoyed an opening more. 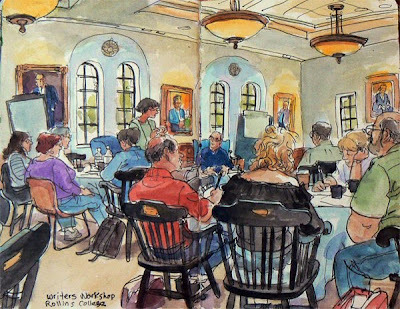 Phil Deaver and Lezlie Laws hosted a writers workshop at Rollins College. The focus for the day was to address the seven challenges that face writers. There is a different energy that is felt when you work in a room full of creative people. I feel it when I sketch. Lezlie discussed reasons she has found to avoid writing. She pointed out that she had manifested hurricanes just to keep from sitting down and facing a blank page. What she usually does however is find busy work. She knows now that if she ends up straightening up in the garage, that she should be writing. She pointed out that when a writer is not writing, they are abandoning themselves. Phil pointed out that he sits down to write even when he has nothing to write about. If writing were easy, then everyone would be doing it. He feels that the important thing is to turn on the spigot. The first sentences he writes are often useless but if he persists they will begin to work. Once the ideas begin to form, the writer can feel a wave of happiness. Phil said that a writer should try to work longer than they usually do, to write even when the ideas are not ready and fully formed. He pointed out that the struggle adds character to the final "sketch" or narrative. Writing is often like wandering into a dark cave without a flashlight. What you don't know will come to you. The artist needs to be open, not digging or forcing ideas into existence. A quote was offered and I paraphrase, I treat writing like a rehearsal, I attempt to try out everything. I reject nothing. Lezlie and Phil had the students do a word association game that forced their brain to remain in the left brain mode, allowing for free association and creative thought. From a random list of words generated by the students they then assembled a paragraph and the results were surprising and strikingly visual. Phil said that authors need to stay at the work table, if they do then everything would come to bear. If the author keeps pushing , then inspiration would come. It comes only when the author is wrestling the muse. The writer has to write about conflict. The story must deal with tensions exploring a dynamic arc. Revelations only come out of that conflict. The author must set the trap then spring it. Many authors promote an illusion by writing around the conflict. Many people are artful dodgers. A writer should not be afraid of failure, a writer should be afraid of not doing anything.